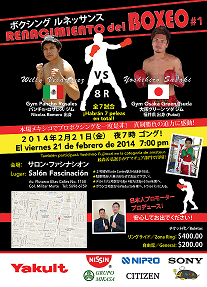 Japanese born Mexican based trainer and manager Hisatoshi Furukawa will make his promotional debut this coming Friday in Mexico. Furukawa, who has been based in Mexico for 18 years, will be putting on a 7 fight show which is headlined by a "Japan v Mexico" contest with Yoshihiro Sasaki (8-9-2, 3) fighting Willy Velazquez (16-3-1, 10). Unfortunately we're currently unsure what the cards 6 other bouts are, though it would seem likely that they will only feature local talent, which is likely what the promoter will be basing many of his shows around. Although the card, dubbed "Boxing Renaissance", isn't a big one or really all that notable in terms of fights we still wish the promoter the best and hopefully, if this is a success, we might see more Japan v Mexico fights taking place under Mr Furukawa's "HI Promotions" banner.